Welcome back to this introduction to baseball terms and stats through the lens of the box score. If you’re new to the game and you haven’t already read Part 1, I’d recommend reading that first, as it covers some key fundamentals and a few terms that will pop up again here. Without further ado, let’s cover what you’ll see in the hitters section of the box score, using the same Giants-Reds example that appeared in the first post. AB: At-bats. The quick explanation is that this is how many times the hitter batted. This doesn’t actually cover a number of situations: a batter gets credited with one plate appearance (PA) regardless of what happens during their turn to hit, but they only get an at-bat if the PA doesn’t end in a certain way. Examples of PAs that aren’t ABs include if they are hit by a pitch (HBP), or if they walk (BB, we’ll get there). RBI: Runs batted in. If the player’s hit results in someone scoring a run, they are credited with an RBI. This particular acronym is the subject of much semantic debate, as you may also frequently see or hear it used in the plural as ‘RBIs’, and then someone else may point out that if you want to get really technical, it’s RsBI. Later, we’ll look at why many modern analysts don’t think you should use it at all. BB: Walks. This actually stands for ‘bases on balls’, because when a pitcher throws four balls (very new watcher note: yes, the ball is what they’re trying to hit, but a ball is also the term for a pitch outside the strikezone), the hitter gets to ‘walk’ to first base. You can also walk a player intentionally (IBB) if you are in a situation where you would rather face the next hitter – a bit like letting a good batsman take a single in cricket when there is a bowler who averages 6 with the bat at the other end. SO: Strikeouts. Nice and simple here, but you’ll often also see it abbreviated as ‘K’, because Henry Chadwick, a pioneer of baseball stat-keeping, decided that it was the most appropriate letter to denote the word “struck”, particularly given that S was already taken for single. As historian John Thorn notes in that link, the phrase “struck three times and was out” was used when Chadwick first began keeping score in the 1860s, not strikeout. The use of K has continued in score-keeping and you will see fans holding up K signs at ballparks when strikeouts are recorded. 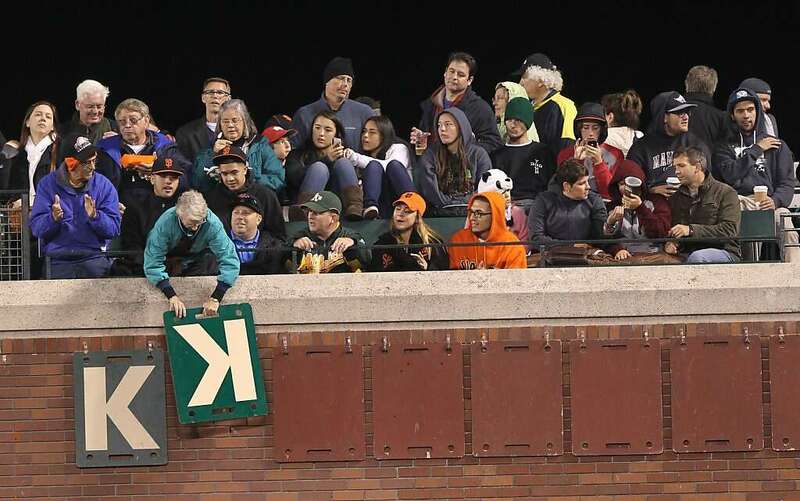 There are also areas where teams hang K boards each time a strikeout happens, such as this one at the Giants’ AT&T Park. A backwards K indicates that the hitter struck out looking at a pitch instead of swinging. #P: The number of pitches the hitter saw. AVG: Batting average, calculated as hits divided by at-bats. All three of the numbers in the final three columns are known as ‘rate’ stats, as they are divided by a measure of the player’s opportunities to give an indication of the frequency of their success, as opposed to counting stats like runs and RBI, which are just absolute totals. Unlike everything else in this table, these represent the player’s numbers for the whole season at the end of this game, not just their rate stats for this individual game. OBP: On-base percentage. There are a few more components here: hits and walks and hit-by-pitches are divided by at-bats, walks, hit-by-pitches and sacrifice flies (SF, again, we’ll get to this). A simpler way of saying this is that the number of times the player got on base is divided by the number of opportunities he had to do so. Maybe you’ve seen Moneyball, in which case you’ll probably know that until fairly recently, OBP was not properly valued by most in the game and wasn’t even an official statistic until 1984. Now, you’ll see it on almost every box score and broadcast, and Billy Beane is having to find much less simple ways to gain an edge on other teams. SLG: Slugging percentage. This is the total number of bases a batter records divided by their at-bats; for instance, Buster Posey, who had three doubles in this game, recorded six total bases in four at-bats, slugging 1.500. Powerful hitters will slug over .500 over the course of a season, while weak hitters will be around .350. Both OBP and SLG correlate more to run-scoring than batting average so they are better to look at when you want to actually know what a player’s contributing offensively, and you’ll often see them added together as OPS (on-base plus slugging), which is considered the most effective ‘quick’ measure of a player’s production with the bat. 2B/3B/HR: doubles, triples and home runs. These types of box scores also tell you how many a player now has this season, which pitchers they were hit off, and in the case of home runs, how many players were on base and how many were out. RISP: Runner in scoring position. This represents the team’s performance in situations in which a player comes to bat with another player on second or third base, as in these cases a single will typically score a run, and so it is a kind of measure of how effective (or not) the team was at taking their opportunities to put runs on the board. In this case the Giants got three hits in 15 at-bats with RISP, while the Reds had a particularly bad game and never put a man on second or third base, the home run representing all their runs. LOB: Left on base, as in the number of runners who were still on the bases when an inning ended. Again, a type of measure of how often a team succeeded in taking their opportunities. DP/GIDP: Double play/Grounded into double play. A double play is when two outs are recorded in one play. In the latter case, it’s specifically referring to a ground ball hit to an infielder, which is thrown to two bases to record outs at each. This is almost always with a runner on first. Triple plays can also occur, but they are very rare. SF: Sacrifice flies. A fly ball that is caught, but allows a runner on third base to ‘tag up’ and score a run. Tagging up is often one of the most confusing things to see when you haven’t watched baseball before. In order to advance on the bases when a ball is caught, the runner has to wait on the base they currently occupy until the fielder has the ball in their glove. At that point, they can then run to the next base. If the runner goes too early and the ball is caught, they must return to the base they left before they can advance. SB & CS: Stolen bases & caught stealing. Runners can ‘steal’ the next base while a pitcher is pitching to the next hitter. This is a fine balance between inching towards the next base while the pitcher is preparing to pitch, and not going so far that they can’t get back to the base they occupy, which would allow the pitcher to throw over for a ‘pickoff’. The runner then breaks for the next base as the pitcher is about to release the ball, meaning that the catcher has to quickly throw the ball as soon as they receive it to the fielder covering the base in an attempt to tag the runner out. If the runner is successful, they are credited with a stolen base; if not, they are out and scored as caught stealing. Got all that? I’m done firing new stats at you for now, as that’s the end of the look at the hitters table, so you can take a breather and try to absorb it. In the third and final part, we’ll run through the stats you’ll find specifically in the pitchers table.